World renowned composer Lei Liang will focus on integrating art, science and technology as the first research artist in residence at UC San Diego’s Qualcomm Institute. Appointed for three years, the music department professor will expand his research on the sonification of coral reefs, highlighted in his “Hearing Seascapes” interdisciplinary courses. 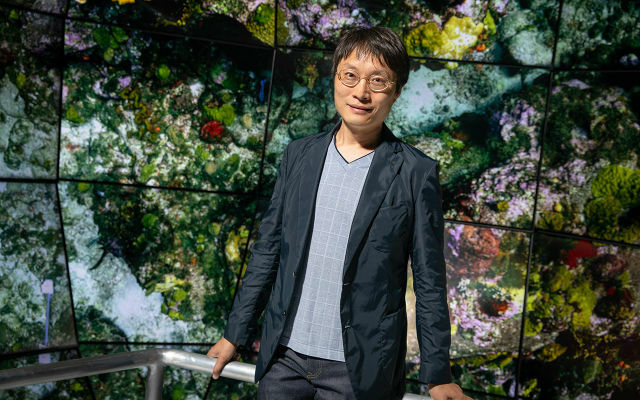 Liang said he will continue his research that used coral reef images and audio to highlight the dangers facing reefs around the world. He has led a seminar in which graduate and undergraduate students use data collected by Scripps Institution of Oceanography researchers to compose interactive, multimedia performances that meld sound, images and movement. Born in Tianjin, China, Liang came to the Unites States as a high school student. He earned degrees from the New England Conservatory of Music and Harvard University, and joined the UC San Diego music department in 2007.